NMA Charts of Austral coke shows only 5 trading signal for the past 10 month. And the more recently on March 7th Austral coke shows a buy signal with heavy volumes. Stock had rised more than 40% from it lows in last 3 trading sessions alone. Any risk takers without tracking news,fundamentals,without bothering about loss or gain until next sell signal ? Thanks a Lot for sharing and updating the Site. 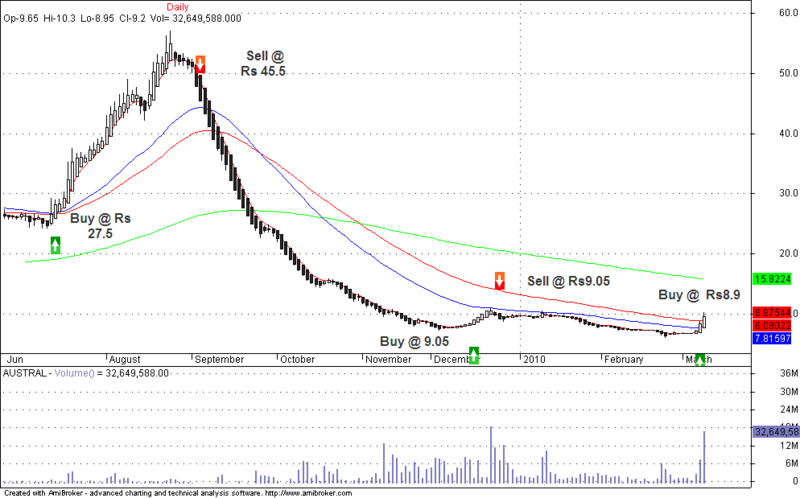 Sir one request to you can you share the AFL which is giving buy and sell signal plz. I HAD 1300 SHARE OF EVINIX AND 500 SHARE OF AUSTRAL COKE ….SHOULD I KEEP IT WITH ME OR SOLD IT IN LOSS …PLEASE SUGGEST ME URGENTLY …….